California sea lions, protected under the Marine Mammal Protection Act, and residing below Bonneville Dam on the Columbia River are not familiar with the term "don't bite the hand that feeds you", or in this case, the hand that saved you. Environmentalists and other critics prefer to point fingers at the dams themselves, human invasion, and pollution as the main culprits in the reduction of salmon numbers, but the fact that these sea lions are killing and eating thousands of endangered salmon and steelhead cannot be ignored or brushed off. The sea lion situation needs to be addressed as much or more than any of the other listed threats. 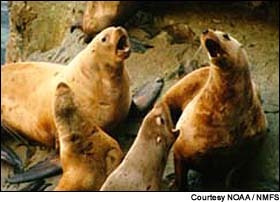 But apparently, it is one of those highly publicized issues no one wants to deal with or be associated with, since a Court of Appeals recently rerouted the issue back to National Marine Fisheries Service officials for consideration on whether to re-authorize the removal and destroying of individual sea lions identified as overly voracious predators. In the meantime, while these two governing bodies bat this issue back and forth, salmon will remain on the menu for the sea lions. Protected Predator <-- Listen at original site.